Scanning several pages at a time is easily achieved with an ADF scanner, however, the MP610 does not have one. 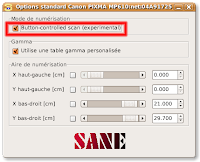 A small command line utility included in libsane-pixma library, named “scan” , can manage the MP610 scan buttons, which greatly helps for scanning several pages. But a graphic frontend, like Xsane, is more comfortable to achieve this. Multi-pages scanning feature has been added to latest versions of Xsane, as well as in other frontends (like gscan2pdf…), for scanning multi-pages documents with an ADF scanner. Xsane can only perform ADF multi-pages for now, as said in Xsane documentation. Scanning multi-pages images, documents, projects, from various Sane frontends is now possible with the Sane library. This fix should also work (but not confirmed) with other Pixma - non ADF - scanners too. Install the latest Sane library as explained in this post. When Xsane detects a MP610, a window (here on the right) gives access to several parameters. Note that this window can be activated from the main menu, "Window/Standard options". Select the “Button-controlled scan (experimental)” option. Click Xsane “scan" button. The MP610 does _not_ start scanning yet. Now go in front of the MP610, and select the scanner mode using MP610 rotating wheel. Choose saving documents to a folder. Place the first page to scan, and press the MP610 "color" button. The first page is scanned, then scanner pauses. Scanning can be stopped at anytime by pressing the "B/W" button (note you will receive an I/O error in your Frontend ; this is currently working as designed, altough a bit clumsy. This behavior could be easily changed). Isn't time to archive on DVD, those old piles of invoices, papers …that fill your drawers…?! I finally had some time to test this feature, and it is working perfectly, the "color" button starts scanning on every page as expected. Thanks again for your feedback. I really thought this was a "must have" feature, for that kind of multi-purpose/office scanner... Hope you'll find it useful too. Now, taking a look at the CD/DVD printing feature, when I'll got some time, after season's greatings! Are you aware of any movement toward linux support for the MP620? I'm vacillating between buying an MP610 for its linux support and trying to share it with other computers or buying an MP620 for its connectivity. This is totally off the subject - multi-page scanning with the MP610 (sorry about that) but I wasn't sure where I might post this otherwise. Some background & then my question. Years ago my wife travelled extensively around the world & took tons of great photos - most now remain on slides. Is there anyway I could use the MP610 to scan these (I guess most likely needing some peripheral)? I tried direct scaan from the slides (laying them on the glass, but of course they came out totally dark. Thanks a million in advance for any advice - even if there is no solution? The solution to your question is ... to replace your MP610 by a MP970 or MP980, as Sane CVS pixma bakend now supports slide and negative scanning (but not yet tested with MP980), results of slide scanning with a MP970 are really impressive, with Xsane, the result is even better than what Canon's software gives. Scanning slides or negatives requires a back lighting unit (that is present on MP970 or MP980), otherwise, you'll get a dark scan. Looks like CCD scanning technology is necessary for back lighting scanning, that's probably why Canon keeps this technology on slide scanners instead of CIS, but CCD requires a little bit of warming up, not necessary with CIS sensors. So CIS or CCD is a choice that is mainly driven by how you'll use your scanner. Does anyone else have problems in Ubuntu 8.10 with a current kernel? (2.6.28+)? What kind of problems ?